Crytek‘s online free-to-play shooter has now reached 25 million registered users across the world. This exciting milestone is reached two years after the initial release of the game. Free-to-play online shooter from Crytek reaches global milestone. 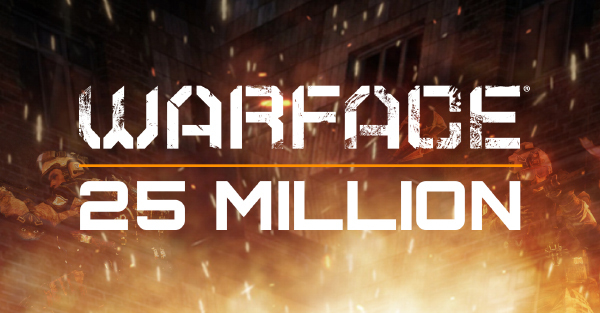 Warface went live in Russia in April 2012, where it enjoyed vast growth within the first 12 months. This success was then bolstered by the game's launch in North America, Europe and Turkey in October 2013 – the same year in which Warface came to Korea and Brazil. Exciting plans are also in place for the game to enter Open Beta in China later this year, with Japan and Taiwan to follow, paving the way for a vast new audience to experience Warface. “It is a fantastic achievement for our franchise and for our teams, and we'd like to thank Warface players everywhere for their support.” said Cevat Yerli, Crytek's CEO and Creative Director. “Warface is part of our games-as-service model, which means the game thrives off and revolves around our community. We look forward to delivering more of the great gameplay experiences that they have come to expect, and can promise the growing ranks of Warface fans that the franchise still has lots of surprises in store." Warface is an all-action online shooter from Crytek, which first launched for PC before Warface Xbox 360 Edition hit Open Beta on March 26th this year. Featuring four unique soldier classes, the game puts a special emphasis on teamwork while completing daring Co-op missions or jumping into intense Versus combat. With daily new missions and fresh content, Warface continuously offers players the best free-to-play gaming experience.